What’s the difference? Items listed above the line tend to vary more (in the short term) than many of those below the line, and so tend to get more managerial attention. 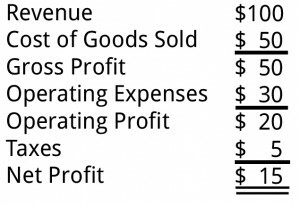 In this sample income statement, you can see that COGS is “above the line” of gross profit and operating expenses and taxes are “below the line.” Amounts shown in thousands. The accounting department has to make decisions about what to include in COGS and what to put somewhere else. Some of those decisions are easy. In a manufacturing company, for instance, the following costs are definitely in: the wages of the people on the manufacturing line; the cost of the materials that are used to make the product. 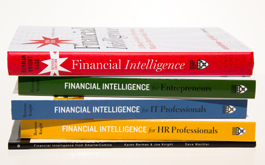 And plenty of costs are definitely out, such as: The cost of supplies used by the accounting department (paper, etc. ); the salary of the human resources manager in the corporate office. Ah, but then there’s the gray area – and it’s enormous. For example, what about the salary of the person who manages the plant where the product is manufactured? What about the wages of the plant supervisors? What about sales commissions? Are all of these directly related to the manufacturing of the product? Or are they operating expenses, like the cost of the HR manager?